Leizhan is located in Hetun Industrial Area, Dawei Town, Henan Province, 50 km away from Zhengzhou city, nearby Chinese first temple in the west---Shaolin Temple. 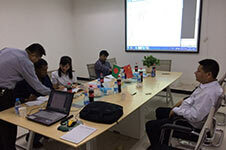 Leizhan has 50 engineers and technicians, and annual production and processing capacity is more than US$15000000. Considering the market orientation, Leizhan is specialized in manufaturing complete set of pulping, screening, cleaning, refining, conveying and thickener equipment, also parts of paper pulp machinery. It has strong technical force, excellent numerical control processing machinery, and perfect detection means. Leizhan company has been certified for State ISO9001 Quality System Certification and owns 14 patents, also passed BV, TUV certification. Leizhan has formed unique, rich cultural connotations after over 30 years develpment. Leizhan takes first-class technology, high quality products, competitive price and perfect service as the basis for Leizhan continuous development. Regard quality as the base, all for customer. Customers mean everything! Everything we do, we do it for your benefit! Leizhan will contact our customers at the first time, get the detailed customer requirements, material component, pre-order the operation site, etc, help our customers analyze problems and solve them. Leizhan paper pulp machine employs advanced technology in the world, passed ISO9001:2008 International Quality System Certification, BV and TUV certification, also owns 14 patents. Leizhan, as the leading manufacturer of paper pulp equipment, with German quality management system and standard, we devote to build a world brand in paper and pulp industry. Quality comes first. Perfect service, stick to the customer-oriented principle.